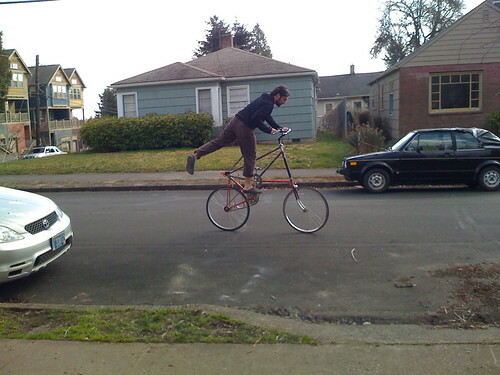 mykle systems labs » Blog Archive » Tallbike! Tallbikes are heavy, so it’s nice to have some gears. I built up this rear wheel around a Shimano 3CC 3-speed hub with coaster brake, courtesy of the Citybikes parts buckets and the truing stand of Megulon-5. 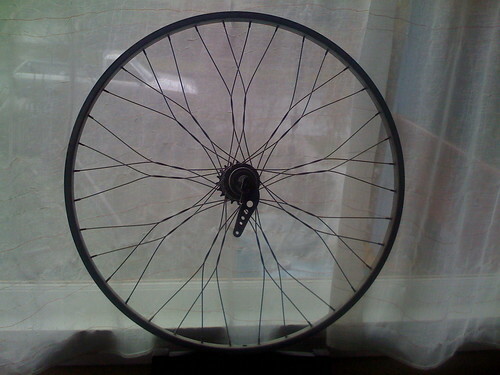 Because I’m a big cheapskate, I took apart a used aluminum rear wheel and re-used the spokes. 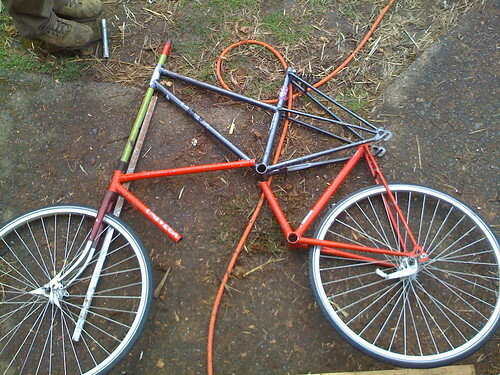 And because those spokes were too long, I twisted them. I’ve seen BMXers and certain tarck bikers do this for looks, but this is the first time I’ve seen it on a 3-speed. 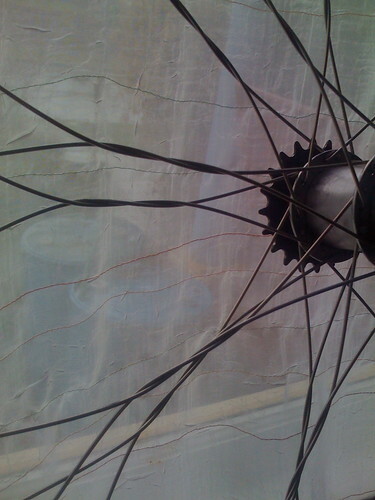 Twisting re-used spokes may prove to be a bad idea — you didn’t get it from me. But there’s a bit of strategy involved in tallbiking. Basically, one doesn’t want to have to jump off, so one looks ahead at every corner for something to lean against or stand on, or else for a break in traffic. Therefore, one approaches every intersection cautiously … just like they taught you in school! That’s why tallbikes are the safest bikes, ideal for beginners. Because of all that, and because of the significant added wind resistance, it’s hard to ride a tallbike too fast. And that’s probably good. I’d hate to take a nosedive from six feet in the air. What’s next for this monstrosity? I hope to replace the granny device with a proper step, grind down a few lumpy welds, and apply a coat of paint. I’m thinking “ambulance”: white with an orange stripe across the middle. I’ll post a picture when it’s done. 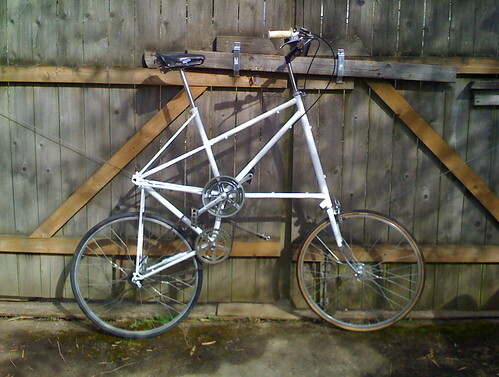 I should also build a silly-spoked front wheel to match my rear wheel. Right now it’s like I’m riding around in mismatched socks! 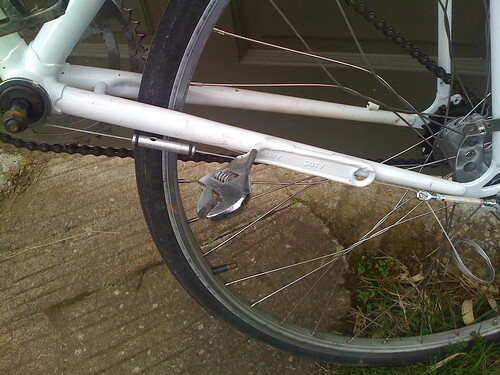 This entry was posted on Thursday, March 19th, 2009 at 9:20 am	and is filed under Bikes, Inventions. hooray!! very nice. hope to see you on it soon. The twisted spokes things is actually likely stronger than a radially laced wheel, and downhillers have been doing it to eliminate chatter caused by braking hard with disc brakes. So there ya go, form AND function! 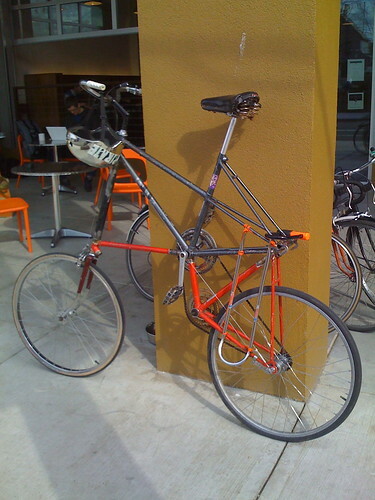 By the way, that’s one of the BEST tallbike frame designs i’ve seen in a long time! I like the paint you have now but of course something wiggy would only make it more so.. Thanks J-Ryde! FWIW, this chop-n-stack recipe would work best with a lower frame that’s several inches larger than the upper frame. these two were nearly the same size, and i had to extend both the seat tube and head tube on the lower frame by about 3-4 inches. sorry, i mean top tube. the head tube is a whole other story. I’m about to build one, next month, I promise. The whole head tube and steer tube part has me pondering. Is that green gas pipe you used to connect the head tubes? I found some 1″ that seemed to be the right diameter, and boy is it heavy. And I got some 1/2″ black pipe which I think I can use to join the steer tubes after I cut the fork legs off the top one. I think it would be smartest to do what you did and join the head tubes with a long steer tube inside, but I wonder if I should just skip that and keep all 4 headset bearings in both head tubes and join the bottom steer tube to the crotch of the top fork. 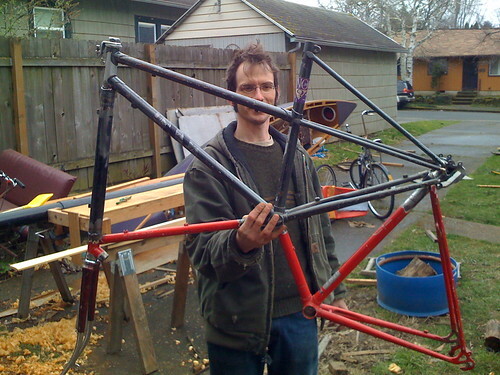 If you can’t find large enough tubes to sleeve around the steer tube, the other thing people do is install a tube — a top tube from some other donor bike, doesn’t have to be any particular size — vertically just behind the head tubes, from the down tube of the top to the head tube of the bottom. There is no normal bike-anatomy name for such a tube … the down-in-front tube? the shrunken-head tube? hmm … but it does work. it seems to leave the headsets a little bit open to the elements, tho. 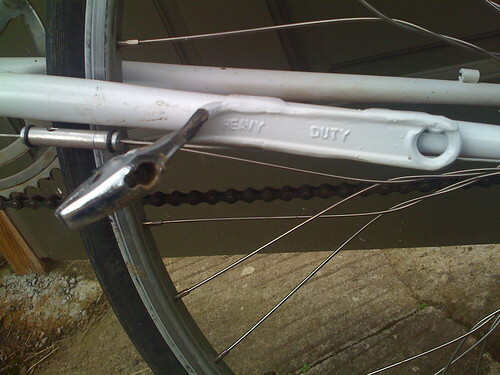 You can also just weld it all together with a complete top & bottom headset, stem to steerer. But unless your fork is cleverly designed to come apart in the middle, that’s a one-way operation — you’ll need a cutting torch when your bearings finally wear out. OMG, i can’t keep my tubes straight! I mean “from the down tube of the top to the top tube of the bottom.” The head tubes, yes, are another story.